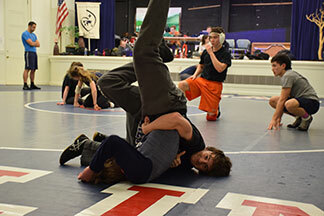 Lucas Horwitz ’19 executes a move during a wrestling practice. The team competes Friday at the Bay Area Conference Championship. With Knights wrestling competition finished, the team looks towards the individual competitions, having finished a successful campaign by capturing a second place finish at the North Coast Section Championships last Saturday and winning the Bay Area Conference Championship at the California School for the Deaf on Feb. 8. Those two guys are senior captains, Jacob Hubbard ’17 and Alex McDonald ’17. Hubbard, who is 25-7, leads the team in nearfall points, nearly pinning your opponent, which is worth two or three points, and in technical falls, winning matches by 15 points or more. McDonald is not to be outdone as he leads the team in takedowns and pins. The senior also claims four tournament wins and a second place finish at the Granada Mat Classic. His 20-1 record is the best on the team. Coast Section Championship by performing well on Friday at the Bay Area Conference Championship. The Knights will be in action tomorrow at the California School for the Deaf as they compete in the Bay Area Conference Championships to fight for spots in the individual NCS competition. 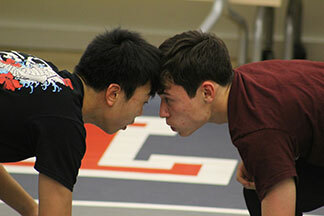 Seven of the wrestlers from this year’s team have previously competed in NCS.